As a teenager, Rossetti Lau was quite determined to find answers to questions raised by life, no matter how long it would take. The answers came... and with them, unexpected and captivating discoveries. Rossetti, now a religious in our lnstitute, reveals the truth concerning her mysterious passage from Buddhism to the Christian faith and to the missionary life. Good morning, Rossetti. Thank you for coming to share with us about your childhood. I was born and raised in Hong Kong. My parents were from Chiu Chow, a small village in the south of China; neither one of them was a Catholic. They he/d on firmly to traditional Chinese values: hard work, the primacy of boys over girls, faithfulness to the family, etc. Being the youngest of seven children (5 girls and 2 boys), I was educated by my elder sisters, for I was a girl; I had to make my own way in life and to study very hard. As for religious values, I adhered to those of my mother. They were a mixture of Buddhism, Taoism and popular religion. Such are the religious beliefs of most Chinese people in Hong Kong. They are expressed by prayers to multiple deities and by offerings of food, money and paper clothing. After my elementary studies, I enrolled at Tak Oi, a high school subsidized by the government and administered by the Missionary Sisters of the Immaculate-Conception. A warm atmosphere prevailed in this school, along with a climate of freedom and family spirit filled with love, which helped me a great deal during my teenage years. This happy experience elicited a fervent desire: I wanted to become a teacher to help other young people with their personal growth. Once I had completed my university studies, I began my career as a biology teacher, and then, for eleven years, I was entrusted with courses in ethics and religion. You were a religion teacher in a Catholic school? Had you anticipated doing this? Let us start from the beginning. 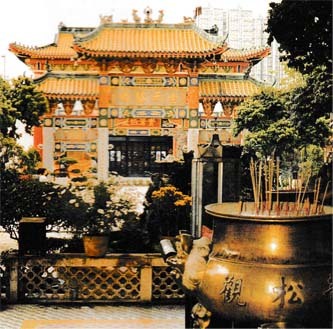 The religion of my childhood was a blend of Buddhism, Taoism and popular religion. Even if I went to a Catholic school, I did not intend to join this religion. I felt no attraction to any of the rites and symbols I observed in the Mass celebrated there. However, the education I received awakened in me the desire to look for something deeper. By the time I was in fourth year high school, I was asking myself many questions. Where do I come from? Where will I go when I die? What is the meaning of life? Why is there so much suffering in life? I began searching for answers. For a short while, I went to some Protestant churches and for a longer time, I associated with Buddhism. The teaching of Buddha about life and suffering appealed to me very much, but I was not getting any answer to my question - Where do I come from? need to decide whether or not to receive Baptism. After a year and a half, I had found no answers yet to all my questions. However, when asked if I wanted to receive Baptism, I felt that in those two years of searching, a peaceful river had flowed into my soul; there was no reason to stop its calm waters ... After ten years of searching, I said Yes! I was baptized in 1986 during the Easter Vigil. This event completely transformed the way I perceived my life. I felt more positive, more cheerful, more alive. This transformation was, of course, the result of numerous meetings, activities and sessions in which I took part on the diocesan level. It can also be attributed to the vibrant life of the parish community in which I was involved. A short while afterwards, I went through some hard times. I was faced with challenges: illness, the experience of my own limitations and inherent difficulties of life. But these challenges proved to be moments of grace. They enabled me to welcome the healing love of God. The Lord was leading me on tortuous paths where I experienced within myself His loving presence, a strong, intense presence. The more He filled me with His love, the more I felt urged to shore with others this message, this Good News of Salvation: Jesus is our personal Saviour, He brings us hope, life and joy. This phase lasted several years, until I asked the Lord, My God, you gave me so much, what more can I do for you? Then, as my relationship with Him was becoming more intense, another question emerged: Would religious life not be a way of living my relationship with Gad more fully? Such a decision was not easy to make, for I had a stable job, a family, friends who loved me, etc. Moreover, I did not want to become a Missionary Sister of the lmmaculate-Conception merely because I had studied in their school. I began to look around at other religious communities to find the one where I could live my life with God. This went on for a short white, less than two years, for I soon understood that no matter the amou nt of information I might gather or the number of people I might consult, ultimately, I was the only one who had to plunge into the unknown. I therefore requested my admission at the Missionary Sisters of the lmmaculate-Conception. Why did I end up choosing this Community? Because the spirituality of Thanksgiving which is theirs corresponds perfectly with my faith experience. One sentence by our Mother Foundress, Délia Tétreault, says it very well: God has given us all things, even his own Son; what better way of repaying Him than to give Him children, chosen ones who will in turn praise Him for his kindness forever? For you, the best way to come closer to God and to give Him thanks, is to take part in the Mission. How did you receive the missionary project in Africa proposed to you by the Community? I went into this missionary experience with trust in God, knowing that He would draw something good from it. 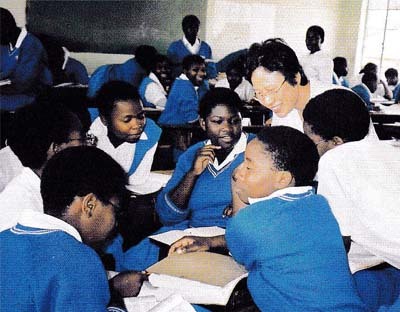 I was pleased to hear that I would teach biology at Marymount Secondary School in Mzuzu. It is a fascinating subject that opens our eyes to the wonders of God the Creator. Besides, I really enjoy teaching and accompanying young people in their growth. But I was not without fear. 1worried about my adjustment as a teacher in another culture: will the students accept me? Will they understand me, a foreigner? Marymount Secondary School accommodates approximately 600 students. Each class has from 70 to 80 girls who come from all parts of the country. Besides teaching biology in first and second high school, I also lead a Missionary Club. It has around fifteen young members. I learn a lot from their sharing. My work in Mzuzu fully meets my aspirations. At Marymount, both teachers and students communicate easily with people of other nationalities and welcome them graciously. I am very impressed by their openness. Malawians are warm, friendly and hospitable. Through my contacts with them, I discover another culture overflowing with joie de vivre, song and dance. 1am learning a different view of time and a different philosophy of efficiency and development. For the people, what is important is the acceptance of life. To take life as it comes, with a smile; to be able to wait, to start over, without making a big deal of difficulties. I am moved by their way of relating to God: it is quite natural and easy for them to pray, to talk to Him. They humbly acknowledge themselves as His creatures, in need of Him. There is still much for me to discover! I am slowly integrating into African life. God is very generous to me through my missionary experience. It is so enriching that I take time each day to savour it. By giving me the grace to serve in Africa, God leads me to a better understanding of myself and of my own culture and values and to welcome those of others. In this way, I come to experience His Love more deeply and to better appreciate the wonders of His creation.